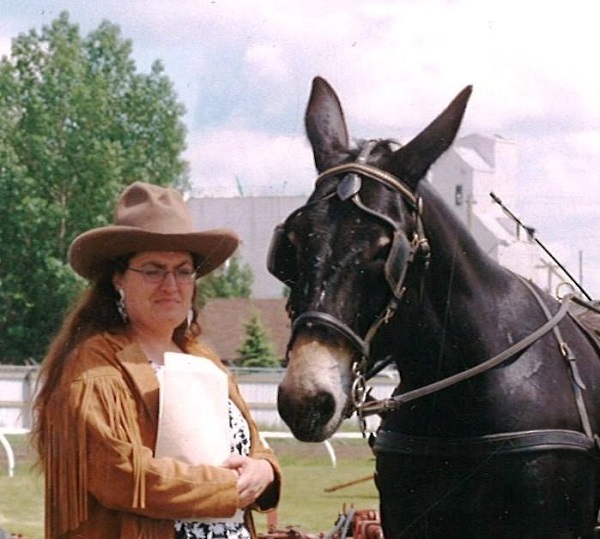 This Mule Tale is a little different – as you know, I normally do a question and answer format, but Linda wrote such a beautifully told story that I had to include it in it’s original layout. What a wonderful mule Rudy is! All images © Linda Marie Leggette. I’d like to introduce you to Rudy. He’s a very special guy, and I am very proud of him. me have him. I had to call my husband and tell him what I had done – bring the trailer! My then husband was a horse trainer, but had trouble working with Rudy. 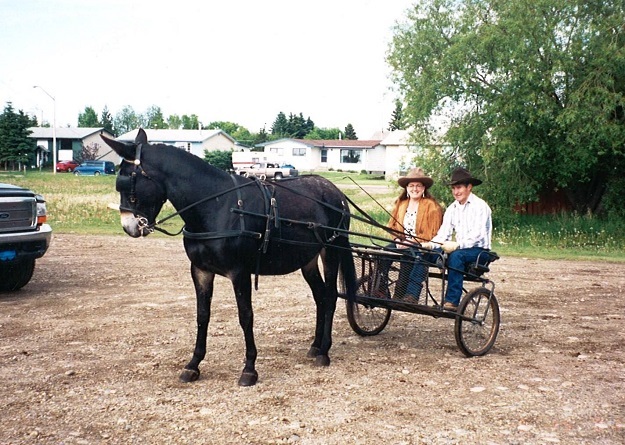 Keith told me about a fellow from northern Alberta who was a good mule man. I called him and he was more than willing to help. I loaded up the truck and camper, and hauled Rudy up north to spend a few days with this gentleman. He taught me how to think, how mules think, and gave me the tools to work with Rudy. I have been forever thankful for his expertise and teaching skills. Since then Rudy and I have made a lot of miles, and for the most, part enjoyed every minute of it. I took him on his first pack trip when he was two. He bucked the packs off, and unfortunately he was carrying the eggs. That’s the one and only time he’s ever done that. He’s made many miles trail riding, and done some arena work. Last year we tried doing drill team work. He’s been shown English and Western. He’s broke to drive, single and double. I’ve enjoyed many, many poker rallies and sleigh rides. stepped into that job like he was born for it, right from the beginning. He’s trustworthy, and loves all the attention. He’s sometimes funny, and sometimes tests my patience, but overall he’s a wonderful animal. Our relationship is more than I could ask for. He knows he’s my mule, and has proven it several times. 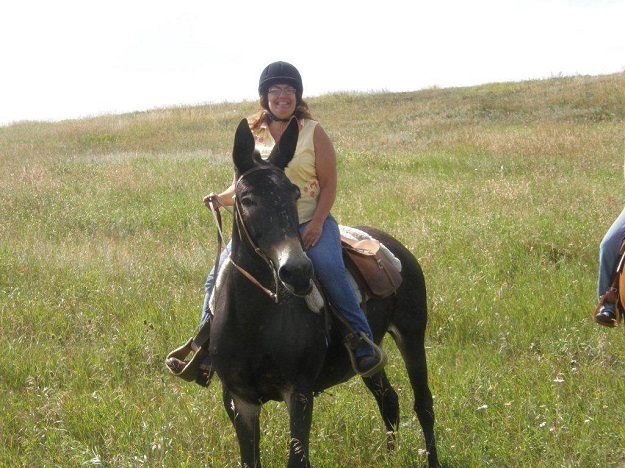 I remember one mule and donkey show many years ago, when my husband wanted to show him in the Western Pleasure class. It was an outdoor show, and it was raining cats and dogs. My husband had told me not to stand near the fence where Rudy could see me. 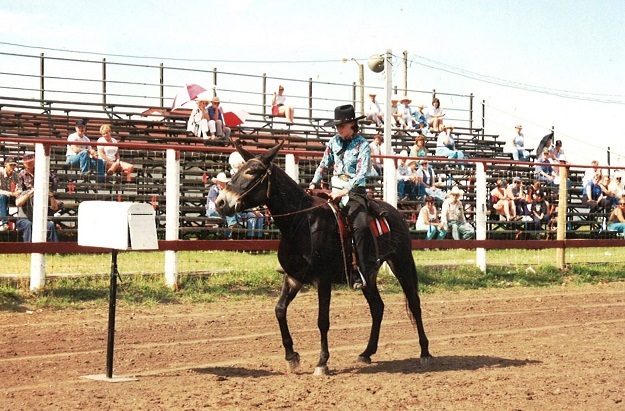 He said, “If he sees you, he’s not going to listen to me.” Everyone there was wearing raincoats and hats, and I thought that there was no way he was going to pick me out of the crowd standing just outside the show ring. I snuck up a little closer to the fence as the class was progressing. I saw Rudy come around at a jog, and things were looking good. The second time around I thought it looked like he hesitated a bit, and Bob urged him on. The third time he came around, he stopped dead as he got to the point where I was standing along the fence. He was about 20 feet into the ring. He immediately side-passed over until he was right beside the fence in front of me. Boy, did I get in trouble when Bob got out of the ring! Another time we were out on a pack trip in the Panther River area in the Rockies of Alberta. The horses and Rudy and were picketed out in the open grassy area. We were in camp, cooking a meal. The animals started getting edgy and we realized there was something in the area. One of the guys went to have a look, and said he caught sight of what looked like a cougar. By this time some of the horses had pulled up their stakes, and were taking off towards the river and the trail home. Rudy, though, pulled up his stake and came hell for leather directly to the kitchen area to me, he-hawing all the way. 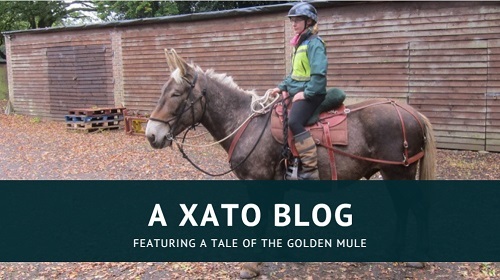 He’s a hit, wherever I go, and I take some flack for riding a mule, and have put up with a lot of jokes, but I find as time goes on, more and more people are just curious about the mules. Many of them would like to try him, or go out get one for themselves. They are not as common here as down south in the U.S., but I’d like to think they will increase in numbers here, as they have some wonderful qualities. Rudy is 28-years-old now, and I hope he is with me for many more years. He’s still healthy and can handle anything I throw at him. He’s blind in one eye, but that doesn’t seem to bother him much. I have a new man in my life, and he is a city guy. He bought a horse, but was afraid of her. He started riding Rudy, and it made all the difference in the world to his confidence. I found him a mule, so now I have mine back. I’d have another ‘long ears’ in a heartbeat.